The Best Fish Dinner Ever! When we travel, we mostly eat at home, but we also like to try local restaurants. Last night, we had a wonderful dinner at a local seafood place in Deltona, Fla.--A&A Crab House. We found the restaurant on Local Flavor ($15 for $30 worth of food). The garlic crabs, accompanied by garlic rice, were delightfully messy and tasty. We were not disappointed. As good as last night's dinner was, however, tonight's was better. Why? Because we at fish we caught! Yes, at long last, we caught something! We have gone fishing every day this week (except Monday). Today we went to Canaveral National Seashore, south of New Smyrna Beach. Yesterday an older couple who fish every day told us about the National Seashore. They guaranteed we would catch something, and we did. Fishing is available either at the seashore itself (beach area) or in Mosquito Lagoon. We chose the latter to dip our lines. It did not take long to figure out how Mosquito Lagoon got its name. Within seconds of exiting the car, we were swarmed by mosquitoes. We couldn't apply repellent fast enough. Fortunately, however, the 'squiters stayed in the wooded area, away from the actual lagoon. 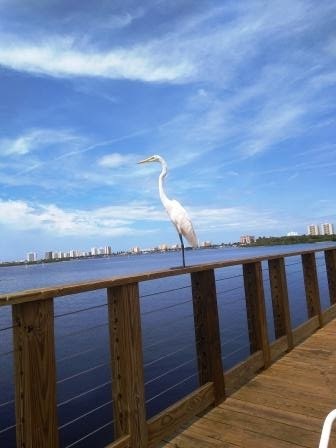 There were a couple of fishing piers available; we shared one with a young couple. 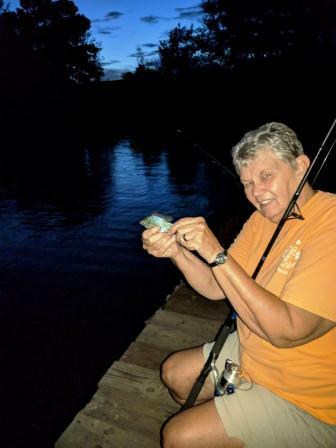 I cast my line, and within a few minutes I had a bite! 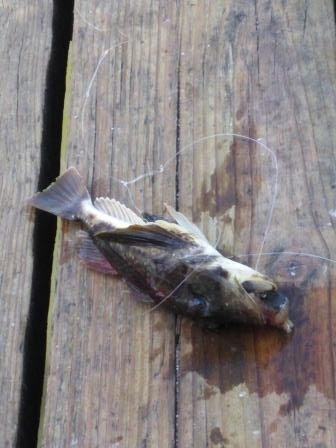 Unfortunately, it was just a pin fish. Generally, we keep any fish that is big enough to provide a fillet. Pin fish, though, are not that tasty, we have learned, and this one was small, so back into the lagoon it went. While we were fishing, we were entertained by the local fauna: A pod (herd?) of manatees made their way into our fishing area. The first one was a mother...accompanied by a baby! Then we spied another, possibly the father. And later yet, another adult joined the group. They stayed in the area, apparently feasting on the underwater salad bowl just off shore. Look closely at the "shadow" in the back of the middle post. It is actually a mother manatee with her baby. Alas, it is difficult to catch sight of them on the surface. Also while we were fishing, we saw several dolphins swim by. Normally, we like dolphins, but they tend to scare away the fish. After all, they are fishing for themselves. Finally, we saw a rare sight--a big fish chasing a smaller one! They were close to the surface and we could see the chase. All the while that the local marine life was entertaining us, we continued feeding the fish. I finally caught a catfish worth keeping. It took Jim a while, but he finally caught a fish that may have been a mangrove snapper. It was small, but we kept it. Those two fish would not have made a meal, but the young man we were fishing with caught a number of catfish. Three were "keeper" size, but he did not want them. So, our meager catch was supplemented with the castoffs from this generous young fisherman. 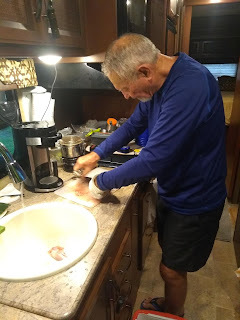 Jim dutifully cleaned all of our fish, a messy but necessary prelude to a good fish dinner. Our dinner was simple, but it was delicious--a bowl of homemade navy bean soup, fried fish, and peas. Eskimo pies for dessert. Life is good. Tomorrow, it is home again. We had a great vacation. August 23, 2018--Everyone needs to get away from the usual routine. We have been getting away more than usual, it seems. And that's a good thing. This week, we cashed in another of our three free weeks at a Travel Resorts of America (TRA) campground. We are at Luna Sands RV Park in Orange City, Fla., about 30-45 minutes east of Orlando. We were not overly impressed with the TRA resort in Lake Oconee, Georgia, a few weeks ago. The resort had potential, but it sorely needed a lot of work. Its best feature was that it was located directly on the lake, with virtually all campsites having a view of the lake. Its worst features included slanted campsites, occasional smelly sewer gas, and poor roads. Compared to Luna Lakes, however, Lake Oconee was a gem. Luna Lakes was the "resort" where we had our introduction to TRA last September. (We did not buy into their program.) They promised that it would be in terrific shape before long. Well, nothing has been done. Describing it as a resort is a stretch of the English language. Campsites are close (although virtually no one is here--good thing for us); the roadway is dirt; the only amenity worth mentioning is a small pool. And it is not close to anything, unless you want to visit Blue Springs State Park. If you wanted to go to the attractions in Orlando, you would have to travel about an hour. That's not very convenient. We knew the downsides of this campground, of course, but we decided to take a week here and bite the bullet to travel to the coast to fish (about 45 minutes). We had planned to fresh-water fish in some surrounding lakes or at Blue Springs State Park, but when we checked them out, we discovered that we would probably not be catching anything: Two different people confirmed that the river and lake oxygen levels were down significantly, from two different causes: last year's hurricane and very heavy rainfall this summer. I don't think the fish have died (although there was loss after the hurricane last year). I think they seek deeper water and are lethargic, due to the low oxygen as well as to the summer heat. That said, we decided to pass on fresh-water fishing and concentrate on dipping our lines in salt water. Tuesday, we fished under a bridge in New Smyrna Beach. That doesn't sound very pleasant, but it was. 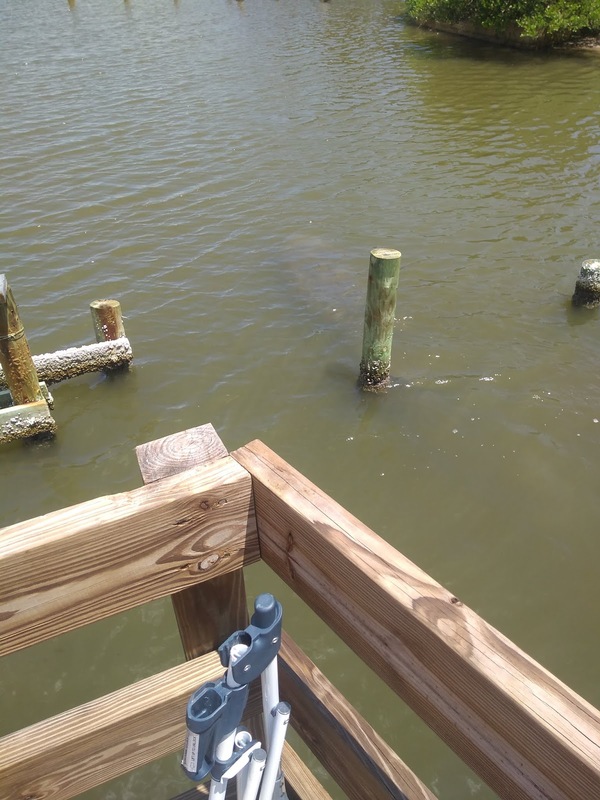 We have discovered that unlike Jacksonville, almost all of the small cities we have visited have invested money in building fishing piers for their citizens and visitors. At New Smyrna Beach we found several such piers. The one under the bridge was great: We sat is the shade all afternoon as we unsuccessfully tried to catch our dinner. The only catch we made was a robin fish Jim snagged. Under the bridge at New Smyrna Beach. The robin fish is a weird-looking fish. It has fins that spread out and look like wings! We believe that any fish is edible, but this one was too small to keep. Wednesday (yesterday) we spent some time fishing on the jetty at the inlet. That was an interesting place. 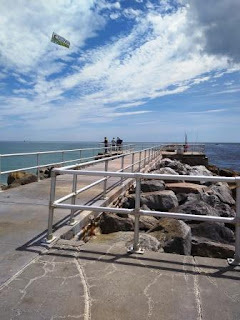 The long jetty is formed by huge rocks. 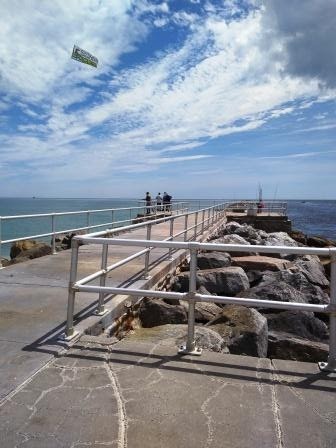 A sidewalk and railings are provided for fishermen, although many prefer to fish from the rocks. We climbed down (cautiously) and carefully set up our chairs and other gear among some relatively flat rocks. We (like almost everyone else there) had no luck. We were also chased away after a couple of hours by a fast-approaching summer storm. 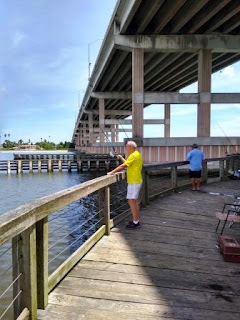 As we drove away from the inlet, the rain let up and we decided to check out another of the piers by the causeway, where we befriended an old couple who fish every day. They were not having any luck (neither did we), but they told us that their favorite place to fish was the Canaveral National Seashore. They said they always catch fish there. When we asked why they were fishing at the causeway instead of at the National Seashore, the lady said, "I drive Uber so I can afford to buy bait. I had to drive this morning, and it is too far for just a short time, so we came here." Fishing means more to some people than just having a good time. we didn't catch anything at the causeway. Bird had to fend for himself! Mike and Susan don't have salt-water licenses, so they did not fish. (Jim and I don't need fishing licenses, since we are over 65.) Mike's hobby is metal detecting. He lent Jim is old detector, and both of them went in search of buried treasure. Their outcome? Each found a car...a hot wheel! Jim's was a Corvette. Jim took only a small break to metal detect; he spent most of his time tending the surf rods with me. Despite our diligence, however, we did not cook fish tonight. The only catch Jim made was a shark--actually almost two sharks. 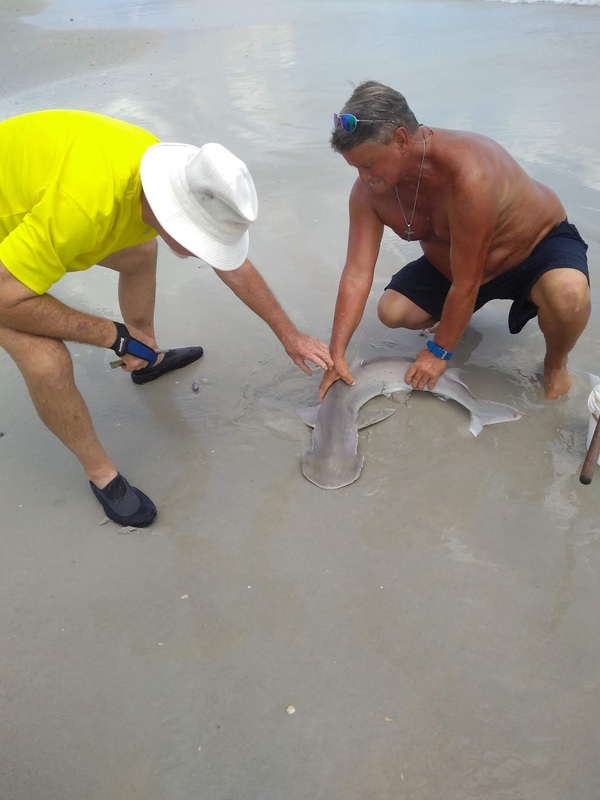 The first one he landed, and with the help of a fellow fisherman, he managed to get the hook out and let the shark back into the water. The second shark (it might have been the same one) disengaged itself just as Jim was reeling it in. Probably a good thing. The sharks were not big, but they had razor-sharp teeth. Jim caught a small shark. Except for the afternoon showers, the weather has been great--not really too hot at the water and the humidity has not been bad. I haven't caught any fish, but I have improved my tan! It is our last day here at Lake Oconee in Greensboro, Ga. Except for Monday, the day we arrived, I believe we have dipped our fishing lines every day. And every day we have provided Lake Oconee's fish a delightful 15-course dinner of big, beautiful red worms. It has been fun. As we sit on the dock and cast our worm-laden lines into the water, we watch the bobbers carefully. Inevitably, within a few minutes, each of our bobbers start to bob. We coax them. "Come on! Bite! Grab it. Take it under!" But no matter how much we urge those little pan fish to bite, they have not obeyed us. Tonight we went down to our usual spot. But, beginning yesterday, the RV park started filling up for the weekend, not only with motorhomes and trailers but also with boats and water skis. I don't think the fish like the wakes these water vehicles make. Plus, kids at play in the water tend to scare the fish away. So, tonight when we went out, our little friends were not even nibbling at their supper very much. As we were sitting there, a boat pulled up. The fishermen asked how we were doing. "Not so good," we replied. How about you?" They then pulled out some of their catch--huge catfish. Of course, they know the lake, and they have a boat. Still, it seemed so unfair. Another 45 minutes. The fish seemed to have lost all interest in eating, and I was losing interest in feeding them. We were ready to head back to the RV. I started reeling in my line, and that is when it happened! A fish! By golly I caught a fish! It was all of four inches long, but it was a fish, a tiny little bream. We packed up and stopped at the fish-cleaning station to show a picture of our fish to those fishermen who had caught the huge catfish. We all enjoyed a good laugh, and then one of them handed us a pound of catfish fillets. We aren't going home empty-handed. August 3, 2018--Do you remember that first-day-of-school assignment: write about how you spent your summer vacation? Well, we are on one of our summer vacations, so I will tell you a bit about how we are spending it. Today we spent part a while in jail...or more precisely, in gaol. Sometimes you wonder if these tourist towns really want tourists. But I digress. We did get the key to the gaol, which is a very interesting piece of history. "The building is patterned after European bastilles. The downstairs cells are like European catacomb cells. Prisoners in the cells could be chained to the wall. They were given a bed of straw, a tin bucket for a toilet and a candle. There was no other light, no heat and no ventilation. People arrested for non-violent crimes were sometimes put in the upstairs room where they at least had light. 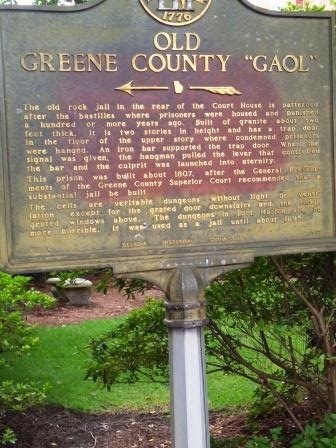 The legal method of execution in Georgia was handing from 1735 to 1924. 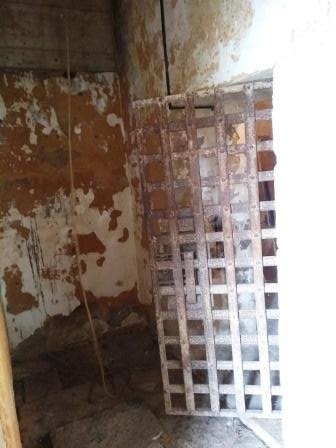 The gallows and trap door of the Gaol are just as they were in the 1800s. The hangman stood on the steps, pulled the lever, and the trap door fell away. The Gaol was used until 1895 when a new jail was built next door. The new jail combined a detention facility with the sheriff's residence. Recently renovated, it is now the L.L. Wyatt Museum, housing memorabilia from Greene County's law enforcement history. Open by appointment." 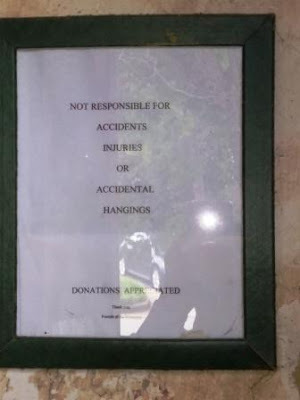 This sign inside of the gaol warns visitors! Jim is incarcerated. I escaped! To the left of the gaol door, you can see a rope hanging from the second floor. Prisoners were hanged there. This is a view of the hanging area. 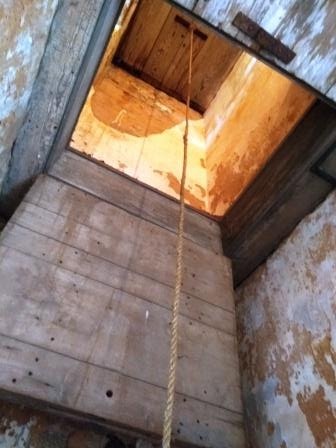 A trap door fell open and the unlucky prisoner was hanged until he died. 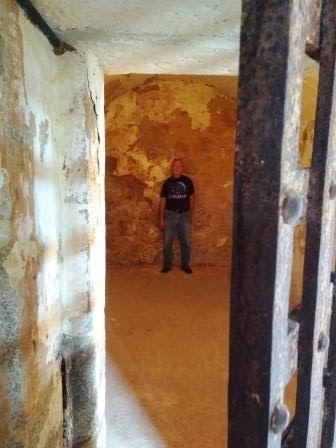 Standing in the gaol, you get a very real feeling for how the prisoners were treated. It was not a nice place. It is a good tourist attraction, however. Too bad the town doesn't make it more accessible to visitors. When we visited Eatonton, Ga. the other day, we found a little gem of a museum, right in the Chamber of Commerce office. As we were asking about things to see around the area, I spied an old-time soda fountain through some glass-paneled doors. The receptionist said it was the Old School History Museum. It contained a representation of the early years of downtown Eatonton, with a facade of a grocery store, theater, bank, barbershop (I even sat in the barber chair, just like the one my dad had, years ago! ), and dry good store. The museum also had arrowhead collections, photographs, and various old advertisements and articles from its Civil War newspapers--all very interesting. We also found another free museum, the Lake Country Discovery Museum, sponsored by a bank. There we learned more about how Lake Oconee was formed by the Georgia Power Company, which not only provides hydroelectric power to the area, but also runs several parks and recreation areas, including three that have campgrounds. Camping in these areas is right on the lake. The well-maintained campgrounds provide electric and water hookups, as well as a dump station. Should we ever want to return here in an RV, we would stay at one of these campgrounds, which are superior to where we are now, and a much more reasonable cost. Our week here is free. This remains a KAO campground, but is being turned into a members-only resort. (They have a LONG way to go before it is really a resort.) KAOs typically cost around $50 a night. Camping in a Georgia Power campground is only $25 a night. Museums are interesting. Fishing is better. But when it is raining, you don't feel like fishing. So, yesterday afternoon we headed to the movies, where the senior special before 6 p.m. was $6. We chose to see "Mission Impossible." We wanted to return today to see the Jurassic Park sequel, but we discovered that the movie roster had changed. Ah, well. We will try our luck at fishing again this evening. Last night we each fed the fish a 15-course dinner. Maybe we'll be luckier tonight. Tomorrow we will take a drive to Georgia's first capital city, Milledgeville, in search of more history. What would a Reluctant Rover blog post be without telling the tales of misadventures? Since we bought Thor, our 27-foot Thor Axis (which is for sale), I haven't had many misadventures to report, thank goodness. For one thing, Thor is pretty new (2016 model, with only 9200 miles on it). For another, even if Thor were to experience problems, we bought maintenance insurance on it. We learned the hard way how expensive some things can be to repair, so we decided not to take any chances this time. Peace of mind counts. This trip we have had a few "interesting" things happen to us. 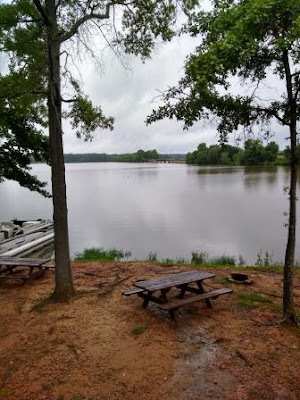 When we arrived here at Lake Oconee, near Greensboro, Ga., and registered, we were told it would be easier and better if we unhooked the car before going to our RV spot. Jim began the process, and as part of that, I opened the car and put on the emergency brake. We use a tow dolly to pull the car. This means that Jim has to physically go under the car to hook/unhook safety chains. Safety protocol requires putting the car's emergency brake on. However, once the car is hooked up, the car is put in park, and the emergency brake is disengaged. When he began the process, I put the emergency brake on. Then, we began talking with Terri, the customer service lady who would lead us to our camping spot. She said we could unhook in the overflow lot and leave the dolly there. We thought that would be a good idea, so we stopped what we were doing and drove over the overflow lot, which was probably about 500 feet (maybe more) away. When we got out of the RV, Terri said, "Your back wheels weren't turning!" Oh, no! When we decided to move over the overflow lot, I forgot to disengage the emergency brake! We dragged our car those 500 feet. Not a good thing. Unfortunately, we were not a stranger to dragging: The very first time we every hooked up a car to our first RV, Jim had attached the braking device too tight, and we actually dragged the car about five miles. That little mishap cost us about $800 in new tires as well as a new brake job, including rotors. This tiny bit of dragging? Well, the rear tires go "thump, thump" and we will have to replace them. The moral: Always go through the checklist, even if you don't think you have to. Checking to make sure the wheels turn is always the last thing I do whenever we hook up the car. The second (mis)adventure concerns the refrigerator. Our troubles with the refrigerator were a major reason why we decided to buy the maintenance insurance. OK, back to the present. Yesterday was a rainy day, not good for fishing. So, we went exploring. 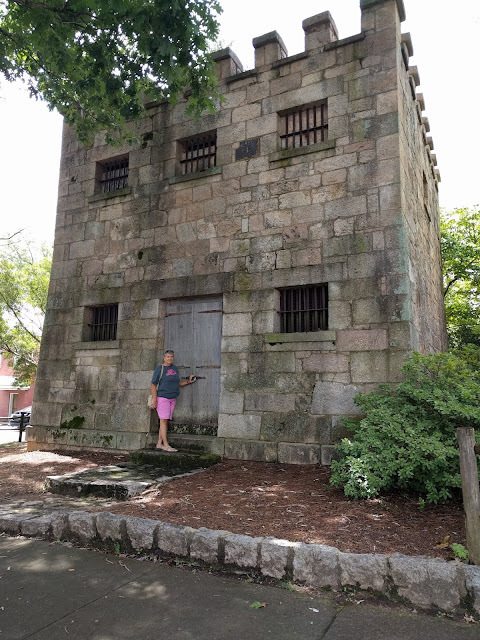 A town called Eatonton, Ga., was among the places we visited. (We had visited Eatonton, home of the Uncle Remus Museum, several years ago, when we spent a few weeks in Georgia on our way up to the Midwest.) We stopped at the Chamber of Commerce to get tourist information, and picked up a flyer about a local butcher shop that prepares its own sausages. ...discovered that our refrigerator was not working! The bag of ice in the freezer had completely thawed. What could have happened, we wondered. Jim considered possible causes, but because of the late hour (and darkness) could not test. He switched from electric (which obviously failed) to gas. But by this morning, the refrigerator still was not working. After cleaning up the melt in the freezer, we needed to find some ice. Fortunately, we had brought a cooler, where we could store our frozen goods. But the RV office was closed, so we had to find a store to buy ice. We spied a customer service person driving around and asked him for the closet place for ice. He gave us directions, which we realized after a bit of driving, took us farther than if we had driving to the nearest Publix. So be it. We found a gas station, bought ice, then programmed our GPS to find a shorter way back. Garmina, however, told us to go back the way we had come, by taking the first right. That would have been OK, except that the first right turn was blocked off, and we ended up on I20. In total, we probably drove more than 50 miles to get two bags of ice, and were gone an hour. A trip to the local Publix would have been about 15 minutes each way. Oh, well. Jim considered possible causes to the refrigerator problem and came up with a plausible one: We were parked on a slant (which I reported in my last blog). RV refrigerators require being level, front to back. If they are not, they cannot cool down. So, first thing this morning we asked to be moved to a level spot. If they could not accommodate our needs, we would go home. 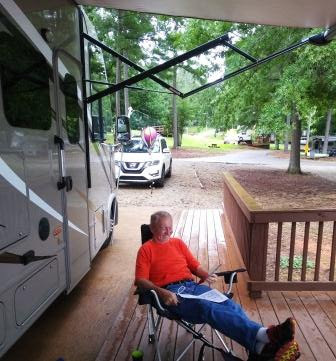 Jim is enjoying the campsite, despite a constant rain. The awning is protecting him from getting wet. Well, here we are. Not only are we level, we are directly on the lake! And the refrigerator? It is once again working. So, fans of the Reluctant Rover's (mis)adventures. I hope I have not disappointed you.